The recently launched Cultural Heritage and Interactive Learning Development (CHILD) Centre is an alternative learning facility for Syrian refugee children without other access to education. The students are making remarkable progress, with children who were broken, traumatised, and fearful becoming happy, thriving learners. 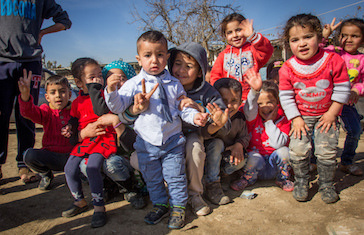 The CHILD Centre, set up by SAT-7 in collaboration with on-the-ground non-governmental organisation (NGO) Biladi, is located in the mountains of Lebanon. The centre launched in November 2017 and in a short time has witnessed some astounding changes. The staff initially found it challenging to help the children adjust to the environment and to go from running around and playing, to sitting in a classroom and concentrating. But SAT-7’s programs helped to grab the children’s attention, enabling them to begin learning through songs and entertaining teaching segments. Many children at the centre have physical or mental health problems, or suffer from disability. Some have learning difficulties caused by trauma. As well as providing educational benefits, the centre is improving the children’s health. They receive two healthy meals a day, and the facility has an on-site nurse. Staff have also helped parents access further medical care when needed. When the centre first launched, the children were worried that they would not be able to attend permanently. Bajjali describes how the children would ask the bus driver if he was coming back the next day and beg him not to forget them. The centre is equipped with a learning disorder specialist who works closely with the teachers on how to deal with kids needing special care. One little girl was particularly struggling when she arrived at the centre. Initially, she did not speak, eat, participate in the classroom, or play with the other children. With gentle patience from the staff, the child has been making slow but steady progress. She is now eating, drawing, and participating in class.